With the temperature gauge in your car generally sitting in the middle or on the higher side of the gauge, most everyday motorists are left to think, and rightfully so, that any instances of cold weather can have a positive effect on their engine, how long it lasts and how well it performs. With such a focus placed on keeping your engine cooler during operation using products like high-quality coolants, it can be strange for an everyday motorist to understand how cold weather could be anything but good for their engines. While there is definitely an importance that still needs to be placed on keeping your engine cool while running, Amsoil Dealer - James Martin has put together some information about how cold weather can take a toll on the performance of your engine, along with its overall lifespan. Can Cold Weather Really Affect Your Engine? When we talk about the effects that cold weather can have on a car’s engine the response is often ‘really?!’. Often confused by information from mechanics to do all they can to keep their engine cool, it can sound contradictory to think that it can negatively impact an engine. While your mechanic is right to give you help to keep your engine as cool as possible while it’s running, the type of effects that we are talking about relates to the lubrication oil that sits inside your engine, which can have a direct impact on your engine itself. You read right - when your engine is turned off and left to sit in a cold environment is where the effects on your engine oil begin to take place, especially if the lubrication in your engine is old or based on a conventional oil. 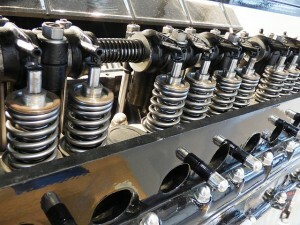 During its regular operation, the temperatures inside your engine begin to increase which in turn warms up a conventional oil based lubricant, allowing it to slide into and provide a basic level of protection in some of the harder to reach places and interaction points throughout your engine. However, when you turn off your engine and it's left to cool down either in a cold environment or overnight as the temperatures dip well below, conventional oil retracts from these places, leaving them unprotected. The impact that the cold weather has on your engine depends on the type of engine lubricant you’re using and varies with each conventional oil product. This makes it even more important that you don’t leave it to chance and arrange a synthetic oil change in Newville. With the designed nature of a synthetic oil based lubricant, the cold weather doesn’t have this effect and synthetic oil is able to remain in its fluid state throughout the most intricate parts of your engine, no matter how cold it gets. Give Amsoil Dealer - James Martin a call at (717) 776-4040 and speak with an expert about how you can get the best synthetic oil change benefits by using a high quality synthetic oil-based lubricant, such as one from AMSOIL’s extensive range. You may be thinking that it’s all well and good for your engine to sit in cold temperatures because when you turn it on it warms up which helps to thin out the lubricant, thus giving it its ability to get where it needs to be. While you’re right to a degree, your engine doesn’t heat up instantly, and often takes a bit of time before it reaches the temperatures that can make conventional oil more fluid again. It is this crucial time between turning your key and your engine heating up where the damage can occur. During this period, the intricate interaction points throughout your engine that we spoke about go unprotected - which is to say that metal parts are forced to grind against and clash with each other without the ever important barrier that conventional oil once provided. How Does That Impact My Engine Life Span? If your conventional oil was to let this happen once, twice, maybe even three times then the effects it would have on your engine would be minimal. However, unless you only start your engine three times after buying it these small instances quickly add up. During these times where your engine’s internals interact without lubrication, the nature of metal of metal means they chip away tiny shards of each part as it operates. As each new shard is taken away the lifespan of that component goes away with it, leading to a decrease in the lifespan of your engine, and an increase in the need to visit the mechanic for replacement parts. For motorists looking to avoid the above-mentioned damage, along with other types of damage that the use of a conventional oil based lubricant can cause, the answer is simple, a quick synthetic oil change in Newville using a high-quality synthetic oil based lubricant. If you’re new to the world of oil and are unsure which product would provide the best synthetic oil change benefits in Newville, speak with Amsoil Dealer - James Martin at (717) 776-4040 and talk about the make and model of your car. Able to choose from an extensive range of high quality AMSOIL products, Amsoil Dealer - James Martin can make sure you get the best synthetic oil change in Newville.